Images of what the future would look like have long been a fascination. 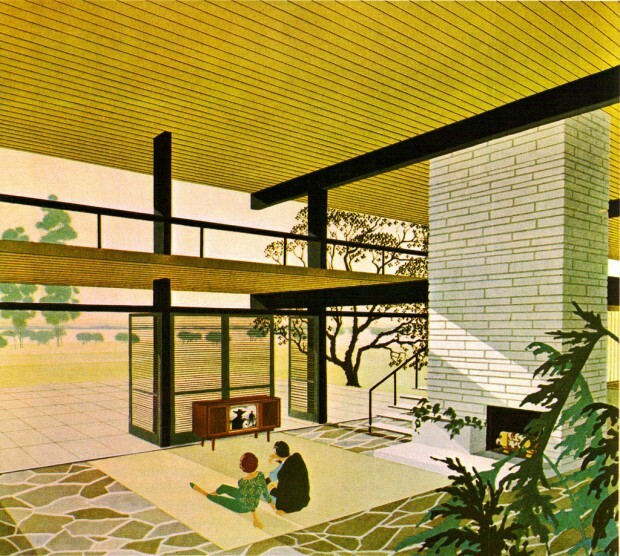 1950’s and 1960’s always focused on a sleek, minimalist future with a very retro (by today’s standard) color palette. It’s easy to dismiss them as silly, until you realize the basis of them is pretty spot on. Media Everywhere – A reoccurring theme in the set is that there’s media (in the form of a TV) everywhere. It’s the centerpiece of every home. This isn’t shocking for an electronics company. For the 1960’s when not everyone owned a TV, this was pretty bold. Of course today that’s true. It’s even a step beyond. Most of us now have phones that can play video. We have laptops. Media is everywhere. Transparency/Lack of Privacy – The other strong theme is the lack of privacy. From open floor plans to glass walls. The future is out in the open. This is hardly just a Motorola idea. Glass House was built in 1949 and Case Study Houses were often built in this style including the notable Stahl House. The illusion to Facebook and social media shouldn’t be lost here. The transparency that’s normal in this modern age was unthinkable in the 1960’s. Of course part of Motorola (the Motorola Mobility part) is now part of Google, and had an influence on both of those changes as cell phones played a big role in both trends. When you really think about it, TV’s are flatter and we cram more things into the same square footage, but these aren’t terribly far off concepts of what the future holds. From a high level they are spot on. These are really the biggest changes to the American home.